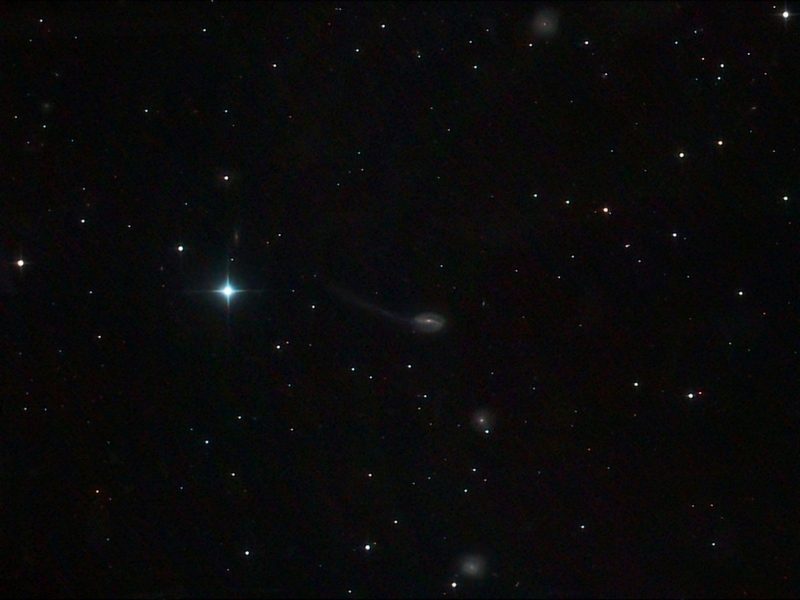 With the run of clear evenings continuing and the windy conditions producing some decent transparency I decided to attempt something a bit more ambitious for MK skies....In Draco PGC 57129 is known as "The Tadpole Galaxy" and its bizarre appearance is believed to have arisen from an encounter with another galaxy at some time. It is one more that produces very little on a Google image search apart from many examples of a superbly detailed view from Hubble. I didn't feel very optimistic as I started taking the subs but with the good transparency and the guiding working well my hopes grew as the session progressed. Getting the tail to reveal itself was the prime objective. Though the individual subs showed no evidence of it I hoped the stacking might detect it and it was very satisfying to see it albeit faintly on the stacked result. The 4 other obvious galaxies are (top to bottom) PGC 57087, PGC 2503300, PGC 57108 & PGC 57109. Of all my images thus far this is one of the most pleasing. When I returned to astrophotography I would never have imagined these more exotic objects were going to be reachable with my equipment and situation. Details: 10" f4.3 Newt. 15x 10minute exposures @ iso1600 with CLS in DSS, FIV, CS2 & XAT. Great work Pete. Anyone would be proud with this image. I'm writing this from my observatory as the guider is calibrating. I'm after Markarian's Chain. Seems pretty mundane after seeing the Tadpole! Thanks John....Best of luck with Markarian's....Transparency is very good again tonight so I'm trying NGC 5987.